Sometimes a cooking class can change your eating habits. I was never a fan of yogurt; it seemed like boring diet food. 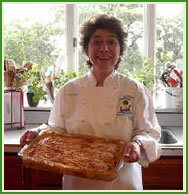 Then, Maria Sakellariou taught a class on how to make homemade Greek-style yogurt. Wow. I started making yogurt regularly at home. I find excuses to use my yogurt in foods (homemade yogurt mixed with honey is a great dessert topping, for example). What makes homemade yogurt so alluring? Join Maria’s fantastic yogurt-making class this Saturday, February 11 at 10 am to find out! Homemade yogurt can be thicker, richer, creamy, plus yogurt can be made with cow’s milk, goat’s milk, or sheep’s milk. Here is one of my favorite dishes with homemade yogurt. I serve these pancakes as a first course or as a cheese course at the end of the meal. Of course, you can just serve these light and delicious pancakes with maple syrup for breakfast. Mix together the egg yolks, yogurt, flour, salt, sugar, and zest. Whip the egg whites to stiff peaks and fold in the batter. Melt the butter on a griddle and drop the batter with a medium size disher (#50). When bubbly on top, turn over. Serve with a scoop of soft cheese or bloomy rind cheese (such as goat cheese or brie cheese) and a dollop of homemade fruit chutney. Place all of the ingredients in a saucepan and bring to a boil. Simmer for an hour, or until thick and jammy. Taste and check the seasonings. If the fruit is too tart, add more sugar.